Successfully Added Max W1 - Watch and DVR (8GB) to your Shopping Cart. Continuing our impressive line of max gadgets, meet the max W1 Watch and DVR where high quality surveillance meets high class watch. With its polished stainless steel face, full leather strap, and hidden video recording and photo snapshot capabilities, the max W1 Watch is definitely more than meets the eye. Covert video recording and surveillance has never been easier as the max W1 Watch allows you to record color video and take instant picture snapshots with just the press of a button. With its huge 8GB of internal flash memory and power-saving design, you can store hours of video footage in addition to thousands of pictures. The max W1 Watch is also a real, high quality timepiece that looks great without garnering any unwanted suspicion. The camera lens is hidden inconspicuously on the watch face while being protected from the harms of daily use by a polished stainless steel. Add to that a full leather strap and sophisticated design and you have yourself a high class, but modestly priced, watch that is a step above most designer watches. 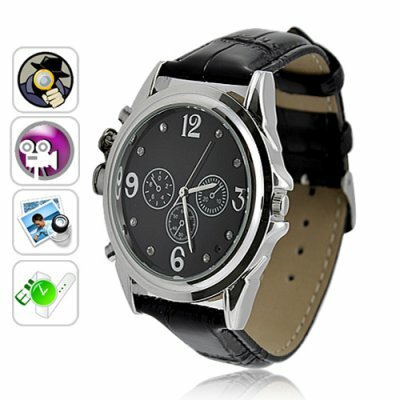 Style, functionality, affordability, the max W1 Watch has it all - look great while taking amazing hidden photos and video. This fantastic gadget is in stock now and available to you at a factory direct wholesale price from the leader in wholesale electronics and gadgets, Chinavasion. How do I change the timestamp? Use the software from the CD. How do the cordial dials on the watch work? The goal of the cordial dial is only to make the watch seem more realistic and add more flavor. on 2010-12-17 05:54:10 Great Value! This watch is great! Does exactly what it says it does, and the look and design is very nice. I would recommend this watch to anyone! I am completely satisfied wsith this watch, I got exactly what I wanted. Of course the camera itself is not the top of the top in the world but it is very usefull and good enough for most of my situations. And to my surprise - the watch itself works good and shows correct time. I can say that this product is better then expected, especially for this money.